The energy partnership between Russia and India gaining strength, with Russian enterprises expanding cooperation with Indian companies, selling stakes in major oil and gas projects, particularly in Eastern Siberia. A consortium of three Indian companies, Indian Oil Corp (IOC), Oil India Ltd (OIL) and Bharat Petroleum Resources Ltd (BPRL) agreed last week to buy access to resources of one of the largest oil and gas deposits in Eastern Siberia; the Srednebotuobinskoye Field. The three Indian companies jointly signed a contract with the Russian energy giant Rosneft to acquire a 29% stake in TAAS-Yuryakh Oil and Gas LLC. The purchase agreement provides for the entry of this consortium of Indian companies into the joint venture created by Rosneft and BP. The transaction is likely to be finalized after getting the necessary regulatory and other approvals. “The attraction of new strategic investors will provide a further impetus to this project,” Rosneft spokesmen said. At the same time, this will expand the funding base for the project, Mikhail Krylov told RIR. This oilfield now produces around 20,000 barrels per day. This is not much when compared to Rosneft’s total production which, at the end of 2014, was 204.9 million tons of oil and liquid hydrocarbons. Oleg Dushyn, analyst at the investment department of VTB24 Bank, believes that the transaction with the Indian companies will have a weak impact on Rosneft’s total indicators. Reserves in the licence areas owned by TAAS-Yuryakh Oil and Gas LLC; in the C1 + C2 categories; are estimated at 167 million tons of liquid hydrocarbons and 180 billion cubic meters of natural gas. The field is connected via a 169-km pipeline to the large Russian trunk pipeline – the Eastern Siberia-Pacific Ocean, by which Russian oil is delivered to the country’s eastern regions and, from there, exported to Asia. Indian companies beat Chinese oil companies, as well as those in the United Arab Emirates, and some other pretenders in this project. Initially, Rosneft was going to sell 49% of the company to the Chinese CNPC. However, the parties could not agree on a price. As a result, minority interest had to be split. In November 2015, 20% of the shares were sold to the British company BP for $750 million. Now, the Indian partners have obtained the remaining 29%. According to analysts of Gazprombank, Rosneft stands to gain up to $4 billion from this transaction. “The sale of non-controlling interest in new mining projects in Eastern Siberia to foreign investors, something the company has been doing since 2014, will help reduce the debt burden, and enable Rosneft to share project risks,” Gazprombank noted in the analytical review. Also, this deal with India will strengthen Rosneft’s liquidity position. This was not the only deal that Sechin concluded during his visit to India. In the presence of the Indian Minister of Oil and Gas Dharmendra Pradhan, Rosneft co-signed a number of documents aimed at building an international consortium for the Vankor Project. The same three Indian companies have signed an agreement on the main conditions for the eventual acquisition of up to 23.9% of Vankorneft JSC. This Russian joint-stock company was founded in 2004 to develop the Vankor Oil and Gas Condensate Field located in Krasnoyarsk Krai. The initial recoverable reserves here are estimated at 476 million tons of oil and condensate and 173 billion cubic meters of natural gas. Vankor oil is a major source of supply for the East Siberia-Pacific Ocean Pipeline. For this project, Rosneft is already collaborating with another Indian company; ONGC Videsh Limited (OVL), which had previously agreed to purchase 15% of the shares. That transaction should be finalized in the near future. During his visit to India, Sechin proposed that OVL increase its total stake to 26%. A memorandum of understanding was signed on cooperation in this field, which also proposed studying prospects for further development of joint activities in hydrocarbons trading. Sechin said the newly signed documents, “without exaggeration, open a new page in energy cooperation between Russia and India,” when it comes to developing agreements reached at the highest level between the Russian President Vladimir Putin and Indian Prime Minister Narendra Modi. “The cooperation format, developed at the corporate level, is aimed at creating a vertically integrated model that provides our Indian partners an opportunity to participate in the development and production of hydrocarbons, and the Rosneft Company with access to the growing Indian market. These reached agreements represent a transition from energy dependence to energy partnership between our two countries,” Sechin was quoted as saying. 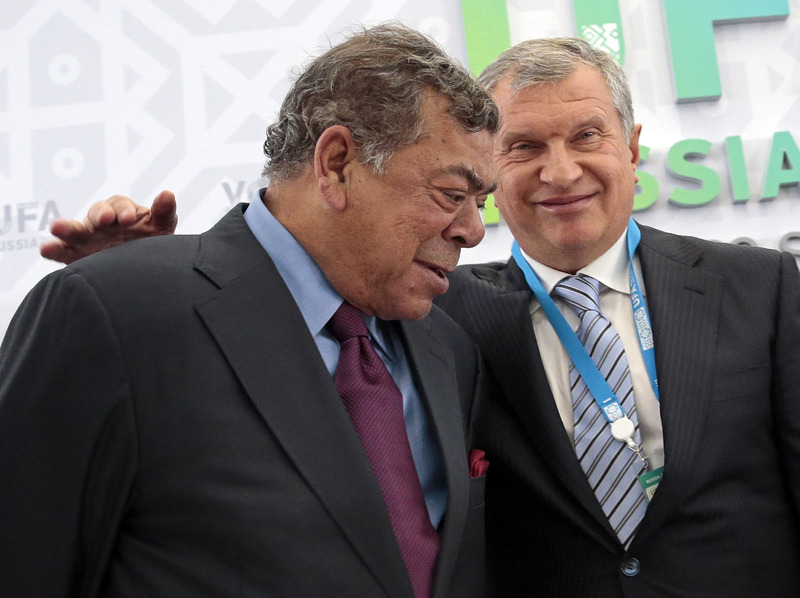 Rosneft also plans finalize a deal involving entry into the charter capital of Essar Oil before the end of June. The Russian giant should obtain a 49% stake. Also, oil deliveries should begin this year, the company announced. Rosneft has signed a preliminary contract with Essar Oil to supply 100 million tons of oil over 10 years for the Essar refinery located in Vadinar. Andrey Kostin, head of the Russian VTB Bank, stated his readiness to provide loans to the Indian company of up to $1 billion for its multi-purpose projects.